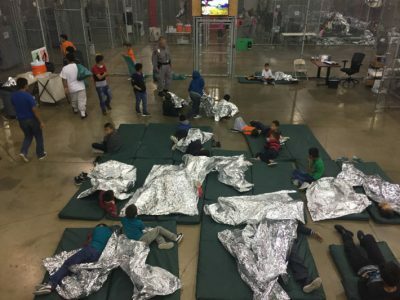 With detention facilities overflowing due to President Donald Trump‘s monstrous immigration policies—which have sent the number of children detained by the U.S. government soaring to a record 12,800—the Trump administration is reportedly carrying out dead-of-night “mass transfers” of children from foster homes and shelters to a crowded Texas tent camp, where they have no schooling and limited access to legal services. While the Tornillo tent camp was originally opened for just a short period in June to accommodate the growing number of children the Trump administration was ripping from their parents’ arms and locking up, the “pop-up city” was expanded last month to be able to hold 3,800 children. “A reminder that the Trump administration is diverting money away from Head Start, the National Cancer Institute, the HIV/AIDS programs, maternal and child health programs, and the CDC to pay for these human rights abuses,” Melissa Boteach of the Center for American Progress pointed out, citing a recent Yahoo News report that found the White House is taking hundreds of millions of dollars from key programs to fund its mass detention and deportation policies. While the Trump administration’s mass separation and detention of immigrant families sparked outrage at home and throughout the world earlier this year, the fact that hundreds of children remain separated from their families months after the White House’s “zero tolerance” policy supposedly ended has slipped from the headlines amid the day-to-day chaos of the Trump era. “Please remember there are 13,000 migrant children in detention. We can’t forget about them,” immigrant rights activist Julissa Arce wrote in response to the Times report. Featured image is from Creative Commons.